This weekend I did a little antiquing and found my new favorite spot! Just north of Nashville, in Goodlettsville, you can find Tara’s Antique Mall :: 3 floors full of lots of great finds. I walked away with these amazing matchbooks, along with the cornmeal & rice bags. I spent WAY too long looking through all the different matchbooks, old postcards, calling cards. I’m obviously a paper girl. So, I’ve decided, there are 3 things I’d really like to start collecting from antique stores :: 1. 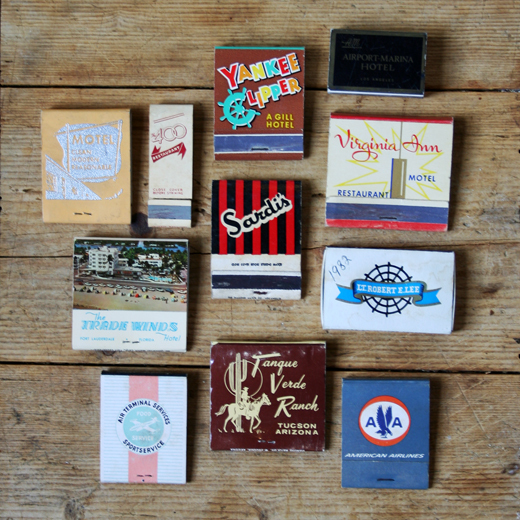 MATCHBOOKS — I can really sit and stare at these. The typography, the colors, the layout. They are perfect… ok, I won’t keep gushing. 2. GLASS JARS — these I did not go home with. I already have several and until I have the home with the perfect shelves to house them, I have to say no. 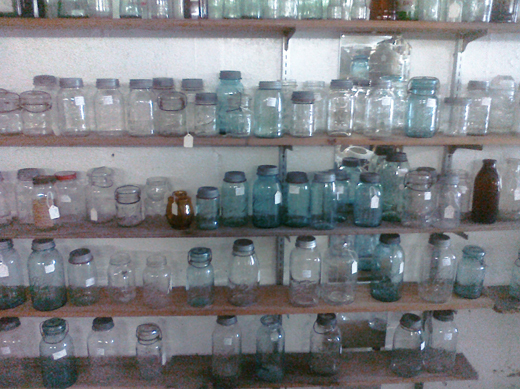 But look at their wall of colored + clear jars. I can think of a million uses for them. 3. BRACELETS — these I did not get into here, but am planning a return trip as well as to find new spots in the area. I think I’ll be able create a collection if I keep my eyes out. So, there you have it…. my new search and rescue plan. I’ll keep ya posted on any additions to the collections.